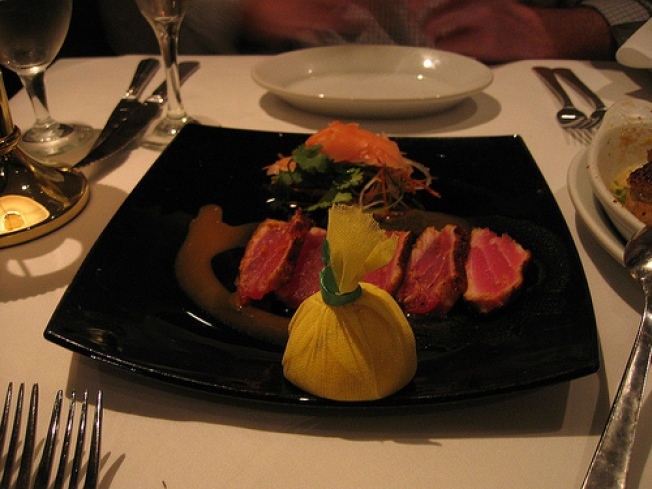 Seared Ahi tuna at Ruth's Chris Steakhouse. This is the first (a) steakhouse and (b) chain restaurant review I’ve done, and it might be the only one I ever do, because I’m just not that big a chain or steakhouse fan. Don’t get me wrong, I like meat. It’s tasty, especially if cooked right. But when I eat out, I go for less common cuisines. Still, when my friend Dominic suggested we go here, I was excited. It seems like everyone raves about Ruth’s Chris Steakhouse, what with their 1,800 degree steaks and sizzling butter. The Ahi was fresh and the mushrooms were hearty, albeit a bit less flavorful than I would have liked. (I like my mushrooms garlicy). Both came generously drizzled with butter and had been seared to perfection. All those adjectives typically used to describe a good steak - tender, juicy, flavorful - Ruth’s Chris Steakhouse had ‘em covered. The lobster was sweet and mild and along with the steak, made for a huge portion. And I haven’t even gotten to the sides yet. The mashed potatoes and sauteed mushrooms rounded out the meal. We knew we were fighting a losing battle in finishing the whole thing, so we focused on the steak and lobster, with a bite of mushroom here and a spoon of potatoes there. We could have rolled out of the restaurant at this point, but our dessert was already on its way. Our chocolate cake was good, but we only took a few tiny bites before calling it an evening. 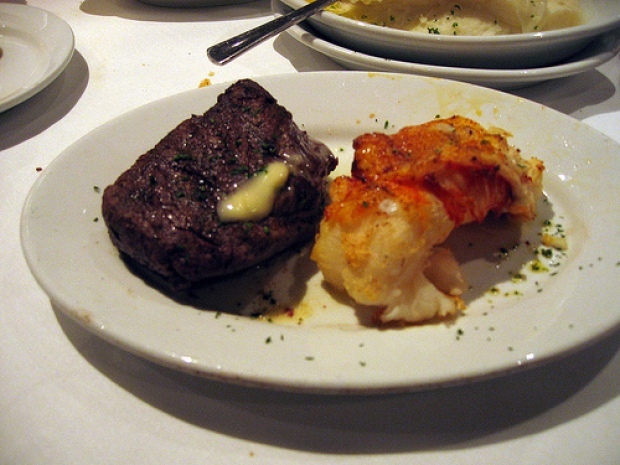 Ruth’s Chris Steakhouse is exceptionally good not only for a chain restaurant, but as a restaurant, period. I know it’s an upscale establishment reserved for special events, but I couldn’t help but feel like I was eating simple comfort food most of the time. The ingredients are basic, the seasonings minimal and the preperation forward. And frankly, that’s not a bad thing at all.